Here, at Raleigh Dream Events & Limousines, we have ramped up our fleet with the addition of multiple Party Buses in Raleigh NC, as our customer feedback has been outstanding with our current party bus units. We strongly suggest to our clients that are going to have 18 passengers or more to reserve a luxury Limo Bus or Party Bus rather than a limousine, as they will be much more comfortable. Being able to walk up into a Limo Party Bus instead of sliding down a seat to get in and out. And most importantly, an extremely powerful AC cooling system to keep up with the extremely hot NC spring & summer temperatures. AC units are much stronger on limo buses than limousines. Limos are not able to cool more than 10-12 passengers comfortably. Based on these factors, you will be able to better differentiate your need between a limousine or party bus. Our customer feedback from 2017 revealed that customers prefer a party bus (luxury limo bus) over a limousine for their wedding. Yes, that is correct – a party bus for a wedding! The added space in a party bus offers tremendous value to customers, as traditional limousines experiences offer limited space across the aisle for larger wedding parties. The features on board our party buses are absolutely amazing. 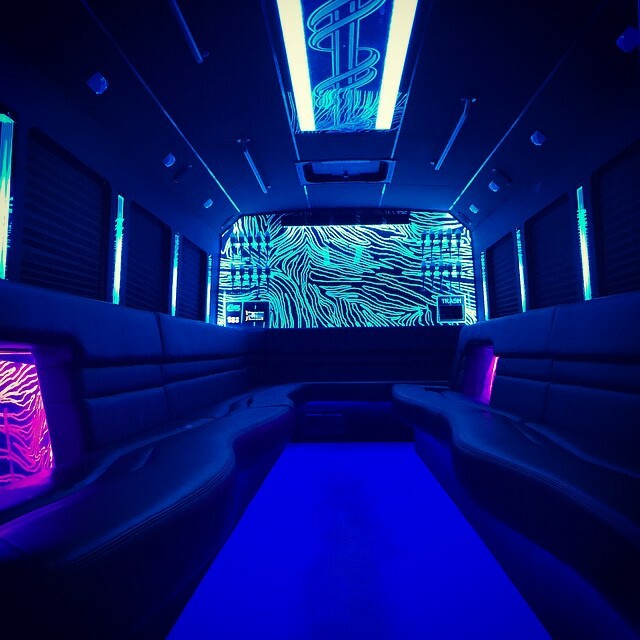 From beautifully crafted leather seating to flat screen T.V.’s and eye-catching LED lighting features, riding in one of OUR party buses is truly an awesome experience! If you are considering renting a limousine or party bus for your wedding or event, give us a call and we will walk you thru the process.